From The music of John Cage, published by Cambridge University Press. Copyright 1993 by James Pritchett. All rights reserved. John Cage was a composer; this is the premise from which everything in this book follows. On the face of it, this would not appear to be a statement of much moment. Cage consistently referred to himself as a composer. He studied composition with Henry Cowell, Adolph Weiss, and Arnold Schoenberg. He spoke often of having devoted his life to music. He wrote hundreds of compositions that are published by a prominent music publishing house, which have been recorded, and which are performed regularly worldwide. He received commissions from major orchestras, chamber ensembles, soloists, and at least one opera company. He is mentioned in every up-to-date history of music. The only monograph devoted to him was in a series of “studies of composers.” Of course John Cage was a composer: everything in his life points to this inescapable fact. The treatment of Cage as a philosopher has had some unfortunate consequences. Foremost among these has been the tendency to see all of his work after 1951–work which presumably shares the same idea about randomness–as an undifferentiated mass of “chance music.” The reduction of Cage’s music to this one-dimensional approach is made simpler by the nature of chance itself. Critics frequently assume that the compositions are formless and without distinguishing characteristics since they believe them to be, in effect, barely more than random noise. If everything in them is determined by chance, then there can be no stylistic difference between one work and another any more than there can be a difference between one list of random numbers and another. “Instead of a music of definable identity,” says one writer, “we have conceptions whose essence is a lack of identity.”7 This failure to see any differences among Cage’s chance works has led to their being treated in a superficial fashion; histories of his work tend to pass rapidly over the works composed after 1951, with a few brief descriptions and generalizations. Cage’s critics have seemed to take the attitude that if Cage didn’t care which sounds became part of his so-called compositions, then why should we bother to listen carefully? It is this attitude and this approach that I reject in the strongest possible way. In the first place, the claim that Cage’s chance pieces do not have distinct identities is complete nonsense. To state that one can not tell the difference between Music of changes, Music for piano, Winter music,Cheap imitation, and One–all chance-composed works for piano–is an act of either profound ignorance or willful misrepresentation. But beyond such an obvious error, the traditional view of Cage fails to answer the question: Why did he do it? If all that Cage was left with after 1951 was the idea of chance, then why did he continue to compose? Cage stated on many occasions that he did not like to repeat himself, that he preferred to make a fresh discovery with each new piece. How do we reconcile this with the textbook image of Cage-the-philosopher, pondering the same tired question for forty years? The portrayal of Cage as only a philosopher fails because it cannot serve as the foundation for a believable account of his work. It demeans the composer by presenting a flat, cartoonish version of his life, totally devoid of depth and insight. The cadences and everything disappeared; but the flavor remained. You can recognize it as eighteenth century music; but it’s suddenly brilliant in a new way. It is because each sound vibrates from itself, not from a theory. . . . The cadences which were the function of the theory, to make syntax and all, all of that is gone, so that you get the most marvelous overlappings. This effect brings to mind the idea of “sounds being themselves,” a common theme in Cage’s work. What is made crystal clear in the story of his composition of Apartment house 1776 is that this idea is musical and not merely philosophical. That Cage chose one set of questions over another was purely a matter of taste and style. The frameworks for Cage’s chance systems were crafted with an ear towards what sorts of results they would produce, so that the questions he asked form the basis of his own distinctive musical style. If either of the first two chance systems that Cage derived for this work had been used, the resulting 44 pieces would still be valid chance compositions–they would still adhere to Cage’s supposed “philosophy.” But it is only the third and final set of questions that could produce music that was Cage’s, that had his style. John Cage evaluated his compositional questions on a strictly musical basis, and so should we. To understand the music of John Cage, then, one not only needs to know something of the mechanics of his work, but one also needs an image of John Cage the composer–his sensibility, his musical style. As with any composer, this style changed over the years, and not just in 1951, either (in this book, I suggest 1957, 1962, and 1969 as major years of change in Cage’s career, but there are others, and mine are not meant to imply a hard division of his work into periods). But constant throughout, from the earliest works to the last, was Cage’s joy in composing: his exercising of his musical imagination, whether through the expressive “considered improvisation” of works such as the Sonatas and interludes, or through the design of elaborate chance-driven systems as in Music of changes, or through the simpler methods of his last works, the “number” pieces. In listening to these compositions, we are witness to the work of a man with a unique and very beautiful sense of musical style. This book aims to present a coherent picture of this John Cage, the composing Cage. I have asked myself these questions: who was John Cage? What was his identity as a composer? Who was the man for whom this work was necessary? I do not present this as a biography, nor as a study of his compositions in themselves. Instead, the focus of this book is on John Cage’s life as a composer, with what it was that he did and why he did it. In this way, one may say that I have written about something in between Cage and his works: the act of composing rather than the composer or the compositions. This study is by no means comprehensive. Some of the compositions I mention only briefly, and others I do not mention at all. Similarly, there are some ideas and trends in Cage’s work that I do not pursue at any great length. 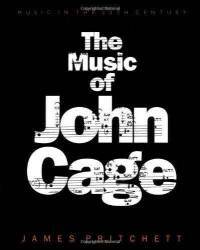 This is in part due to necessity–Cage wrote an enormous amount of music and his work touches on an astonishing range of other subjects. However, this book is also very much my own personal view of Cage’s work, shaped by my own attempt to put the pieces of his life together into a coherent picture. In each chapter, I have tried to bring the various disparate materials together into some believable portrait of a composer’s life, dispensing with everything but those ideas, techniques, experiences, compositions, and writings that I feel contribute to a satisfying and enlightening account of how and why Cage did what he did. Cage once indicated that he wished critics would be “introducers”: people who could take music and, by writing about it, turn it “into something you can deal with.” This has been the model I have tried to follow in this book. By keeping uppermost in my mind the image of Cage composing, I have tried to write about his music in such a way that, in some sense, it will remain unexplained, but which will still make it into something that can be dealt with by each listener in his own way. In the end, there is no substitute for the direct experience of Cage’s music itself: this book should be seen as opening a door into that work rather than presenting the final word on it. If you feel it necessary to listen to one or more of the pieces I discuss in the course of this study, then I will consider myself a success. Certainly nothing pleased Cage more than for others to enter along with him into his musical world.